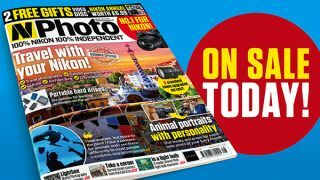 N-Photo 88 on sale now! We all love a weekend getaway, and with that in mind I hopped over to Barcelona to see the sights and experience the culture that this buzzing city has to offer. I had my Nikon in hand, of course, and show you how to return from a break with images that document your travels, rather than the usual holiday snaps. Our Apprentice goes on a wildlife shoot in Sweden with a difference – using props and hidden treats he manages to capture the cutest critter shots imaginable. In our interview hot seat, Jo-anne McArthur’s photographs of animals are of a very different variety too; her disturbing and thought-provoking portfolio highlights their mistreatment at our hands. In our projects section, we show you how to: master the basics of Shutter Priority mode; create a surreal levitating portrait; correctly set up your tripod head and explain the different types available; stitch together a sequence of sporty images into an action-packed montage; plus improve your photos in Photoshop, Lightroom and Nikon's Capture NX-D software. In our packed gear section, we put standard zooms through their paces in our Big Test, try out half-a-dozen portable hard drives for safely backing up images, and give the fabulous Tamron 70-200mm f/2.8 G2 the full test treatment.